The World Subud Association consists of member countries; to quote the WSA bylaws: “the name of the international association of Subud national organizations is the World Subud Association”. It is member countries that ultimately provide direction for the association during World Congresses; again from the bylaws: “Congress is the supreme authority of the Association and its Affiliates”. Between congresses member countries participate and provide direction through their representatives on the World Subud Council. As the latihan of Subud is a divine force working within us and as it is meant for all humankind, it is global by nature. Therefore, the Subud organisation needs to encompass all peoples, while at the same time respecting our specific local and regional characters and cultures. In the same way as each one of us tries to allow the expression of the latihan experience in our worldly lives, the outer representation of Subud needs to, among other things, reflect the global nature of the latihan and that Subud is open to everybody, independent of race, religion, cultural or social background. The international organisation is vital because it provides this outer global umbrella expressing and protecting the universal nature of the latihan and of Susila Budhi Dharma world wide. The nature of the topics discussed in the international area involve issues that can have an effect or repercussion on Subud all around the world. Out of 86 countries where Subud is present in the world, 54 are member countries of the WSA. A list of countries with Subud members may be downloaded. 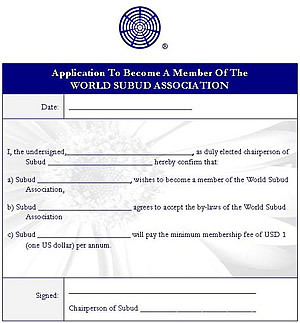 Being a member of the World Subud Association implies the right and the responsibility of participating in the work of the association: to be present at and to vote resolutions at World Congress; to participate in the choice of the zonal representative of ones zone and to interact with the zone representative between World Congresses; to be able to give input through consultation with the Subud members in ones country. To become a member of the WSA, a country must accept the constitution and the bylaws of the WSA, which are binding, and be endorsed by World Congress. You may read some of the responsibilities of national bodies. The bylaws of the WSA can be downloaded. For other languages, visit the Constitution page herein.